Liverpool coasted to a 4-0 win at home to Red Star Belgrade in the Champions League, with Mohamed Salah, Sadio Mane and Roberto Firmino all scoring. 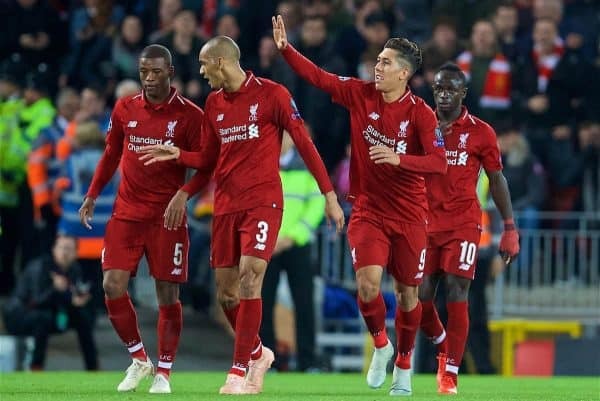 In their bid to go one better than last season’s final defeat, the Reds were handed one of the Champions League‘s more comfortable double-headers on paper in Group C.
The first of two back-to-back clashes with Red Star came on Wednesday night, as Jurgen Klopp‘s side looked to return to winning ways after a 1-0 defeat to Napoli earlier in October. Klopp made five changes to the side that won 1-0 at Huddersfield Town at the weekend, with Fabinho starting and Xherdan Shaqiri retained after his impressive display in Yorkshire. This saw Liverpool take to the pitch at Anfield in great shape, despite injuries to Jordan Henderson and Naby Keita, and were buoyed further by the absence of the visitors’ supporters. The Red Star faithful were banned from the stadium as punishment from UEFA, and Klopp’s side rewarded their own vocal supporters with an emphatic win. Klopp deployed his exciting side in a 4-2-3-1 formation, with Salah up front, Shaqiri on the right, Mane on the left and Firmino in the No. 10 role. Red Star took the game to the hosts early on, in a surprise move, and proved to frustrate Liverpool as they sought to pick the lock in front of a well-organised defence. 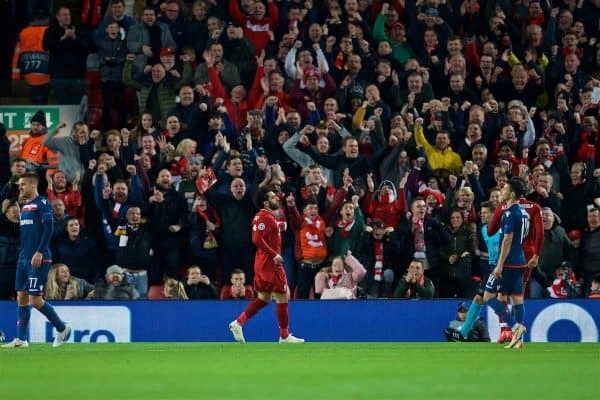 The responsibility fell to Shaqiri, and continuing his flawless start to life on Merseyside he found the rampaging Andy Robertson with a perfect through ball, and Firmino was on hand to fire home the cutback. Shaqiri remained a threat as the midfield pairing of Fabinho and Gini Wijnaldum settled in behind him, and Red Star’s opportunities decreased as a result. Robertson almost added a second for Liverpool as half-time closed in, but flashed wide after calling for the ball from Mane’s touch on the break. 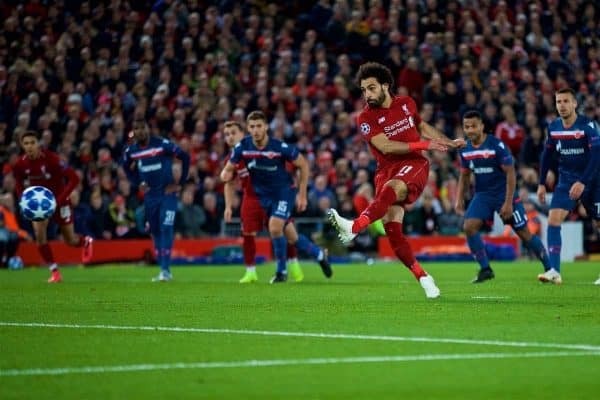 But the Reds didn’t have to wait long to double their lead, as Shaqiri touched across Wijnaldum’s drilled ball into the box for Salah to power into the back of the net. Liverpool began the second half camped on the edge of Red Star’s penalty area, clearly not content with a two-goal lead, with Paris Saint-Germain’s 6-1 home win the inspiration. A late call from referee Daniel Siebert gave the hosts another chance as Mane ran into the trailing arm of Filip Stojkovic in the penalty area, and Salah was on hand to rocket his spot-kick past Milan Borjan. Shaqiri was awarded a standing ovation from all corners of Anfield as he was replaced by Adam Lallana on 68 minutes, acknowledging his supreme contribution once again. The Reds could have added a fourth through Mane after Siebert awarded another penalty for handball, but the Senegalese’s effort was well saved by Borjan. Quite why Fabinho, whose record for Monaco was outstanding, wasn’t elected to take the spot-kick is baffling—and a goal would have capped an excellent display from the 25-year-old. Mane, however, made amends on the 80th-minute mark, picking up substitute Daniel Sturridge‘s pass and poking past Borjan to make it 4-0 and an easy win.